Form: The Stele depicts Hammurabi on the right and the sun god, Shamash on the left. 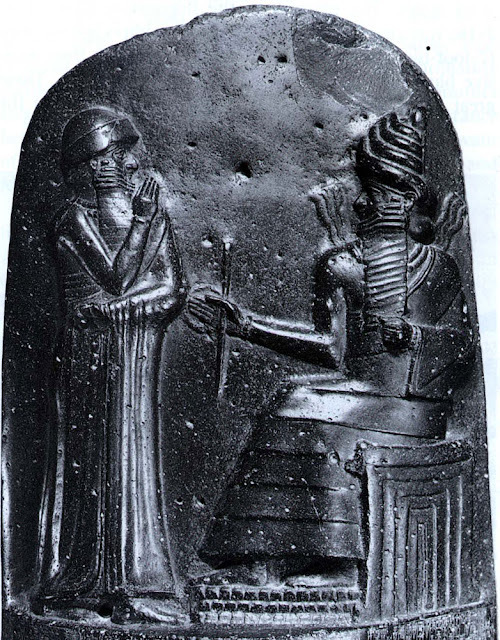 Shamash is handing the measuring rod to Hammurabi. It is made of black basalt and has a picture on the top and writing on the bottom. The figures are in composite view. In a composite view, the face, feet and arms are in profile but the torso is depicted in the frontal view. Sometimes the eyes are a frontal view although the face is in profile. Iconography: The three steps upon which the god rests his feet are iconographic of this meeting taking place on a mountain top. 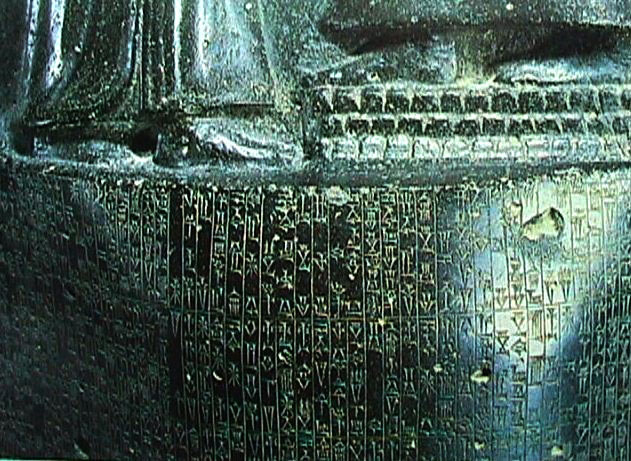 The larger seated figure is the god Shamash. (The use of size to indicate importance is referred to by Stokstad as hieratic scale.) Both Shamash’s size and the flames surrounding his represent his larger than life divine status. The flames surrounding his head are icons of his role as god of light or enlightenment and they symbolize power and ideas in much the same way our comic books represent figures with a lighbulb above their heads to represent a good idea. 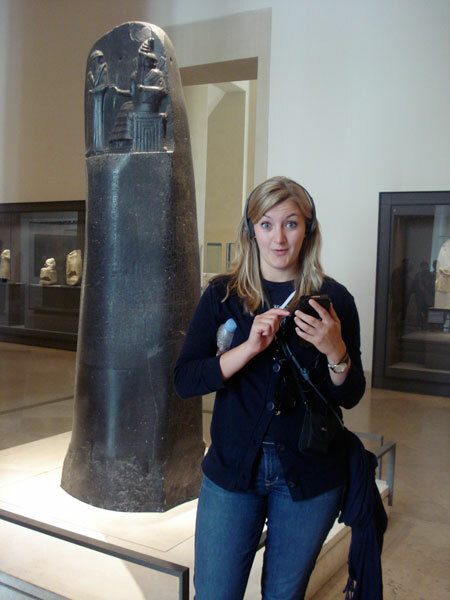 This meeting is symbolic of Hammurabi’s divine right to rule and pass judgment. Shamash hands over a staff of rule or rod. 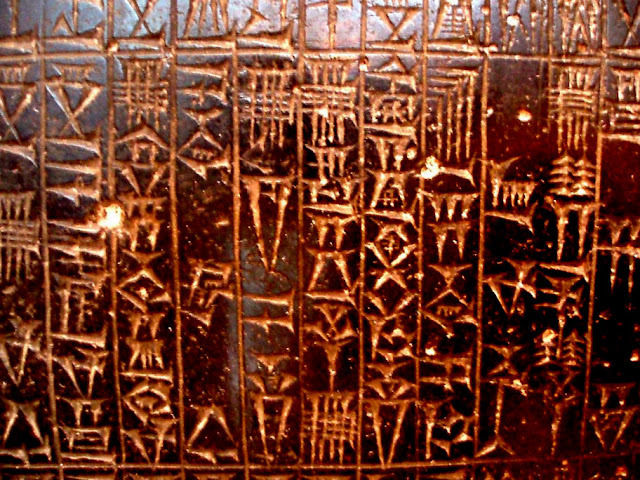 This represents Hammurabi’s divine right to act as Shamash’s earthly representative. Context: This is a stele that was used to ensure even treatment of people throughout the kingdom. The punishments were set in stone so that there could be no confusion as to how to deal with a situation. The punishment varied depending upon race, wealthy, and class. It was one of the first documents that we have that described a legal system.